Poke, pronounced POH-kay (like “okay”), is a native Hawaiian dish that’s cropping up all over the mainland. Hawaiian restaurants like Island Flavor, in Las Vegas, NV, are giving the traditional, South Pacific fare a modern twist. While poke visually looks similar to smoothie bowls, this island classic may not be exactly what you would expect. The two traditional poke ingredients are chunks of cool, raw, sometimes marinated fish, and hot steamed rice. Hawaiian restaurants now add plenty of other components to this flavorful mix, including cooked meats, tofu, cabbage, cucumber, dragon fruit, and avocado. 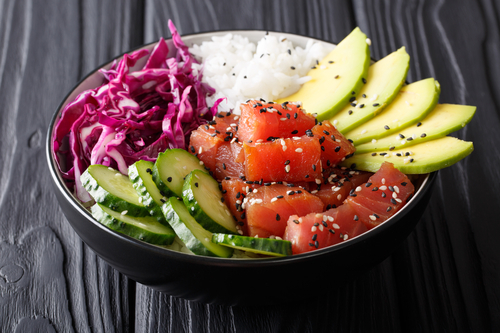 Poke tends to appeal to health-conscious palates due to its incorporation of vitamin-packed raw meats and veggies, and lack of processed ingredients. Poke has existed for centuries, long before Captain James Cook landed on Hawaii and started the colonization process. It’s assumed that the dish began as seasoned raw fish on a bed of seaweed, but as Japanese and other Pacific influences made their way to the Hawaiian Islands, other ingredients were added. Over time, onions, soy sauce, sesame oil, and other traditional East Asian elements became common to Hawaiian cuisine. As supermarkets began to appear in Hawaii, poke bars were created inside of them. In the same way mainland supermarkets might allow you to make a plate of different pasta, potato, egg, or chicken salads in the deli section, island supermarkets offer different varieties of rice, seaweed salads, meats, and other toppings. The poke being served on the mainland is vastly different from that of centuries past, but the modern version is quickly gaining popularity due to an old favorite. It’s no wonder the dish is getting so much attention: with its rich flavors, health benefits, and beautiful, photograph-worthy colors, there’s a little something for everyone hiding in a bowl of poke.